Last week, I had the opportunity to participate in a strategic war game. For those unfamiliar with the term, imagine a business strategy competition where four teams are posed with the same problem. The unique twist of a war game is that each team is assigned the identity of a real entity (e.g,. the management of a health insurance firm) and must justify all the decisions it makes by demonstrating consistency with the existing operations and culture of the real thing. 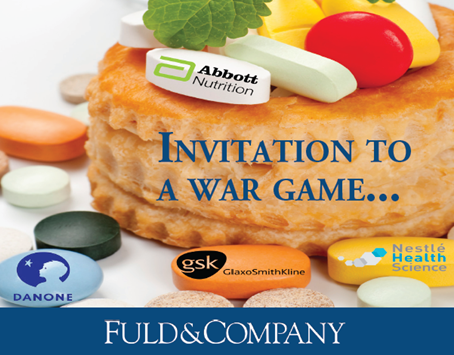 While these can be organized as internal professional development opportunities, this particular war game — entitled “Designer Foods – who will win Big Pharma or consumer goods?” — was an Oxford-Cambridge face-off organized by Fuld & Company, a business intelligence firm. The basic premise upon which the four teams’ arguments turned was how scientifically-engineered super-foods would develop in the coming years. Specifically, would the expected explosion in health-oriented food products that enhanced wellness be led more by science-based pharmaceutical firms (e.g., GlaxoSmithKline [or GSK] and Abbott Nutrition) that lack brand recognition with consumers or traditional consumer goods firms (e.g., Nestle Health Science and Danone) who understood consumers but have struggled with regulatory concerns over their prior health claims? The intentional ambiguity of what qualified as a “designer food” and what potential scientific advances were on the horizon made the ensuing presentations and Q&A sessions highly unpredictable and insightful. The consensus ultimately reached by participants and observers alike was that this gray area between food and medical product is developing unusually fast and not without controversy. Risks abound for a company to find itself either a) not being able to bring consumer-friendly markets to product quickly enough, or b) not being able to justify satisfactorily any health claims to government watchdogs.For example, both GSK and Abbott had substantial history in medical nutrition (e.g., infant formula, adult disease-specific supplements), but neither had successfully grown a brand in a consumer-oriented product segment. Conversely, Nestle was intimately aware of its consumer reputation as too much a “confectionary company,” and Danone was being dragged through courts on multiple continents for health claims it had later amended with its Activia line of digestive yogurt-based products. The solution put forth by our team (and others) was that the firms gathered could best participate in this new market ecosystem by partnering with complementary firms. For example, we were assigned GSK and strongly advocated the firm formalize new product development with a consumer goods firm (e.g., Nestle, Danone, Unilever) to quickly move into the space. Our argument rested on GSK’s ability to provide “scientific credibility” to consumer goods firms’ health claims. However, not everyone agreed with this strategy. The Danone team returned in a later round to not only reject an offer to partner with a major pharmaceutical company but opted to leave the functional food market (and return to its traditional fresh-dairy products without health claims) after a game twist led to increased regulation of food products making health claims. It will be interesting to see where the designer food market ultimately goes. One of most important findings I noted during my business research for the competition was the lack of credible products in the space. There are a number of medical food products that will soon hit the market (e.g., chewing gum to reduce blood phosphate levels in kidney failure patients); and there remain a number of essentially rebranded naturally healthy products like yogurt with active cultures. What I was unable to find were products intended for the mass market that made uniquely novel health claims. It is certainly possible that rather than a dominant player establish designer foods as a strategic growth market, the role of high-science, mass-market foods dwindles out for lack of promising development. Disclosure: I received a share of the prize money awarded to the first place team by Fuld&Company the Oxford-Cambridge War Game simulation. As of June 2012, I am currently engaged with one of the firms above on a short-term consulting project unrelated to designer foods. « What to do about the worldwide healthcare workforce shortage?